How I Got This Book: I received it as a galley for review. You've probably heard about this book. If you haven't, well you are ESPECIALLY who I want to talk to today. You have no expectations or preconceived notions. The hype hasn't invaded your mind! I was lucky enough to read this book last November and I didn't know anybody else who had read it yet because ARCs had not gone out yet and nobody was really talking about it on Twitter. I don't say this to sound like a DOUCHE all HEY LOOK AT ME I'M SPESHEL..I say this because I hadn't heard anything about it AT ALL. Truly and in the purest sense. There were NO expectations. And that is the place that I think is the best place to be for this book. To have randomly picked it up on a whim and gone into it blind as opposed to hearing a lot from the book community about it. Not to say you still can't enjoy it having heard about it, oh certainly you can, but I'm saying that is the BEST place to be. We Were Liars was a book that surprised me. It had me weeping and I totally didn't expect what this book contained. I loved E. Lockhart's prose (seriously the writing is gorgeous!) and I really enjoyed reading about the Sinclair family (super rich & dysfunctional & I wanted to punch certain characters). 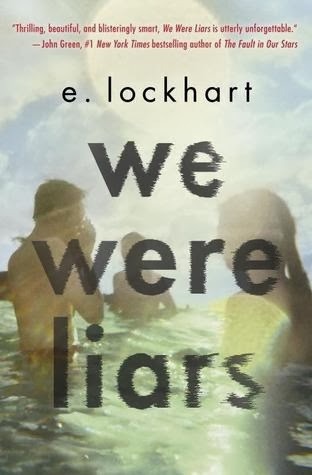 The main character's memory loss and her return back to the family's island was just so compelling and I became addicted to find out what the Liars did and know all the secrets and lies that were just bubbling on the surface of this family. It's suspenseful, beautiful and heartbreaking. Honestly one of the best books I read this year. And it came as such a surprise to me. I knew I'd probably like it by the summary but it hit me like a freight train. So, if you haven't read it. Don't read anything more. Just don't. Go pick up the book and read it. It's much different than what I've read from E. Lockhart previously (all which I enjoyed) and I LOVED IT TO PIECES. Have you read this one? What did you think?? I read this book late last year, too. (I'm a bookseller and thus get ARCs and digital ARCs). I'm afraid I had the opposite reaction to it that you did, but that's perhaps because this book struck several readerly pet peeves of mine. I think E Lockhart is a good writer, but this really was not the book for me. I've seen lots of reviews for this one but luckily none of them really gave anything away. I read this last week and am still not quite sure what I think about everything that happened in the book. It's definitely one that you need to know as little about as possible. I also loved it!! That ending was like a slap in the face it was so surprising! I just bought this one the other day...now I totally need to put it on my top-tbr. Totally agree with you and great review! This book is best enjoyed blind and that's essentially what I said in my review...and not much else! I read it this week, and went into it completely blind. I did not see the ending coming...it was so amazing! It's one of my favorites so far, and I wasn't really a fan of E. Lockharts previous books. They were okay, just not really my taste. But I think I've now been converted. So, so good. I'm amazed I didn't cry. But the bookhanger afterwards was a whopper.